Wireless speakers are always a good investment. You can buy a rugged speaker that is guaranteed to survive the test of time and extreme conditions, and you can spend at least a year or year and a half listening to your favourite rhythms out loud no matter where you are. Although most people prefer earphones or headphones for listening to music while they are at work, but let’s face it, we don’t spend all our lives in offices. It’s so much better to listen to music on a wireless speaker at home, at house parties and even on vacations. Needless to say, the market for wireless speakers is a crowded one and it has a lot of players competing with each other. And one among them is personal audio and mobile accessories brand Sound One, which makes wireless and wired audio products as well as cables and chargers. The company has this week expanded its portfolio in India with the launch of its Drum portable wireless speaker that is priced at Rs 3,490. If you are an interested in buying the Sound One Drum wireless speaker, you can head to Amazon and Flipkart’s websites to order it for yourself. And in case you aren’t too fond of online shopping, you can buy the speaker offline from select retailers. We should add here that the speaker is available at a discounted price of Rs 1,990 on Amazon India‘s website. Coming to the specifications of the newly launched Sound One Drum wireless speaker, it comes with Bluetooth 4.2 for connectivity and has IPX5 certification, which means that it is water and dust resistant. The Sound One Drum portable wireless speaker has a fabric-wrapped exterior that covers its two drivers of 5W each. The combined output of the two drivers is 10W. You can also insert a microSD card in the wireless speaker, and it can also be used for hands-free calls by pairing it with your smartphone. The Sound One Drum wireless portable speaker houses a 2,000mAh battery which, according to the company, can last up to 8 hours with a single charge. 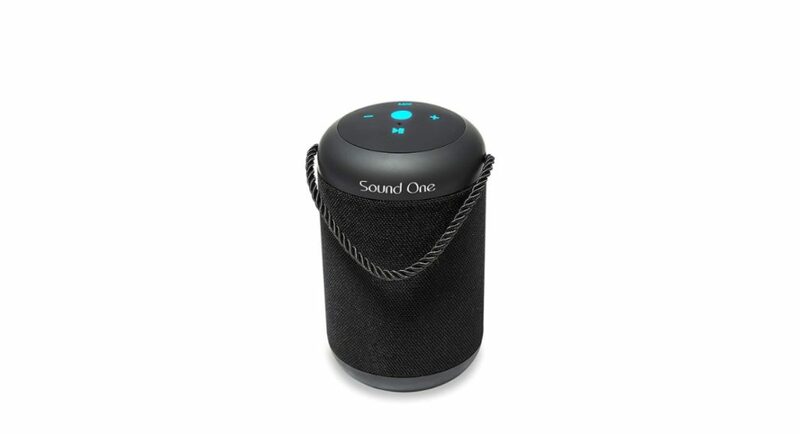 The control buttons of the newly launched speaker by Sound One are placed on the top and in order to make it simple to carry the speaker, Sound One has also added a fabric ribbon. The wireless speaker weighs 649 grams and comes with support for 3.5mm and USB cables.